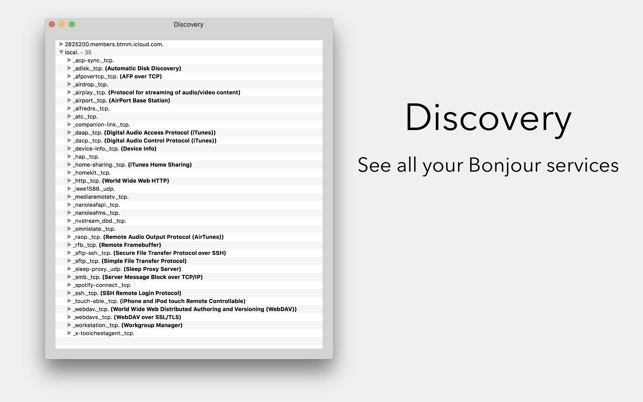 Discovery is a utility that displays all of the Bonjour services available on the local network or on Wide-Area Bonjour domains. Use it to debug your latest program, detect computers connected to your network, or just keep tabs on what services are available. Perfect for network admins or developers! • Display recommended browsing domains with spaces correctly instead of showing \032 escapes. • Sort domains and services case-insensitively. This is a very simple application which is very useful in specific circumstances — when you need to know what devices are on your local network, what services they provide, etc. With HomeKit devices which support WiFi, for example, you can match their name, IP address, and MAC address. You can see which computers have SSH enabled, or screen sharing. (Assuming they’re enabled through the normal OS X mechanisms, which support Bonjour.) A great addition to the toolkit of OS X network administrators (including advanced home users). 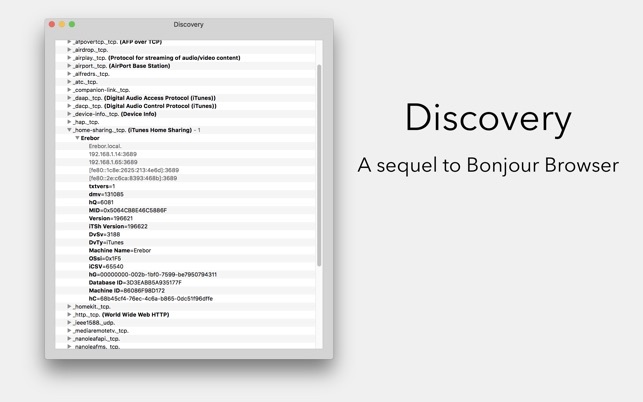 Awesome simple Bonjour developer tool now on the App Store! I've used Bonjour Browser for years, and for quite a while it wasn't updated (didn't really need to be). But with the App Store release, it has been brought up to date, and resolved a few little issues that have always plagued me with earlier releases (no more "Canot resolve link-local name" in a service's listing). Yes, you can run dns-sd on the CLI but this tool is far more convenient for monitorinig. Simple, elegant and effective! Thanks KB for the update! Great small, focused app showing the services published on your local network - nothing more, nothing less. Solid implementation. It has never crashed on me. Every net admin (and many power users) should have it always at their fingertips.